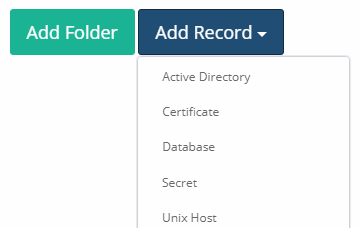 Xton Access Manager provides a variety of out of the box Record Types to assist in creating, organizing, connecting and establishing inheritance (parent/child relationship) of formulas, strategies and policies within your records and secrets. The following FAQ article will list and define each of the available Records Types in XTAM. If you would like to hide Record Types from users, enable the Hidden checkbox. These hidden record types can still be used; however, they will not appear in the Add Record dropdown menu. Record Types can also be configured to allow their use in Personal Vaults. If you would like them to be used in Personal Vaults, check the Personal Vault box and if you would not, then uncheck this same box. Please note that the ability to create custom record types is only available for System Administrators. A description of the main use for this type when creating records. Can this record type be used for establish remote sessions and/or execute strategies. A list of the default fields includes with this record type. Field Name: [field type] Description of the field. Field Name: [field type:secured] Secured field means that its content is masked and can only be unmasked by clicking the Unlock button. For more information about Secured fields and Unlocking, please read this blog post. Used to store an AD/LDAP account or any account that requires a username and password combination. Ideal use for reference records. Cannot be used to establish a remote session, but can be associated with Password Reset tasks. User: [string] The user name to be used with this record. Password: [string:secured] The password associated to the user in this record. Used for Active Directory queries to execute tasks on mass for multiple computers stored in Active Directory. Cannot be used to establish a remote session, but can be associated with Password Reset and other tasks. User: [string] The user name to be used when executing tasks. A Domain Administrator account is recommended. AD Query: [string] The Active Directory query that will be executed of which the results will be used as Host(s) for each task execution. Used to establish a SSH connection to an AS400 host for access that requires a username and password. Can be used to establish a remote session and be associated with Password Reset tasks. Host: [string] The host name to be used with this record. The name may be an IP address, computer name, FQDN or something else. Port: [number] The port number required for this connection. Used to store an Azure or Office 365 account that can be setup with a Password Reset task. Used to store a certificate file so that it can be shared between users and teams while maintaining a “source of truth” with auditing events. Cannot be used to establish a remote session. Cert: [file:secured] The certificate file to be stored and used in this record. Used to establish a connection to a Cisco device for SSH access that requires a username and password. This can optionally be configured to automatically switch to Enable mode using the supplied password. Can be used to establish a remote session and be associated with Password Reset and custom tasks. Enable Password: [string:secured] (optional) The password that will be automatically entered in order to switch to Enable mode. Enable Level: [string:secured] (optional) The Enable level, blank defaults to level 15. Used with Google Chrome Remote Application information in order to launch the Google Chrome Web Browser native remote application and provide URL and login parameters to a web site. Can only be used to establish a remote session using the native application. URL: [string] The URL to be used to launch the web site. User: [string] The user name to be used when logging in to the web site in the native remote application. Used to establish a connection to a Informix database. Useful to executing strategies (scripts) against the connected database and to reset database passwords. Cannot be used to establish a remote session, but can be associated with Password Reset and custom tasks. Used with Internet Explorer Remote Application information in order to launch the Internet Explorer Web Browser native remote application and provide URL and login parameters to a web site. Used to establish a connection to a Juniper device for SSH access that requires a username and password. Used to establish a connection to a Microsoft SQL database. Useful to executing strategies (scripts) against the connected database and to reset database passwords like ‘sa’. Used with MS SQL Studio Remote Application information in order to launch the MS SQL Server Management Studio native remote application and provide connection parameters. Host: [string] The server name to be used when logging in to the native remote application. User: [string] The user name to be used when logging in to the native remote application. Used with MySQL Workbench Remote Application information in order to launch the MySQL Workbench native remote application and provide connection parameters. Stored Connection: [string] The name of the MySQL Workbench Stored Connection that should be used for connection. Please note that a Stored Connection in MySQL Workbench is required and needs to be accessible by the user account specified in the Remote App Host record. Password: [string:secured] The password associated to the account saved in the selected Stored Connection. Used to establish a connection to an Oracle database. Useful to executing strategies (scripts) against the connected database and to reset database passwords. Host: [string] The connection string needed to connect to the database. This may require port number, SID and other such values. User: [string] The user name to be used when establishing the connection. Used to establish a connection to a Palo Alto Networks device for SSH access that requires a username and password. Used with PC5250 Terminal Remote Application information in order to launch the PC5250 Terminal native remote application and provide connection parameters. User: [string] The user name to be used to authenticate in the remote application. Used with PuTTY Remote Application information in order to launch the PuTTY native remote application and provide connection parameters. Host: [string] The host name to be used when logging in to the native remote application. Port: [number] The port number to be used when logging in to the native remote application. Used to establish a connection to the host that has been configured with Windows RemoteApp functionality. Filter: [string] Enter the Record Type of the Remote Apps that can be remotely launched using this host. Multiple record types should be separated with a comma. Enabled: [checkbox] Check to Enable this server to act as a RemoteApp host or Uncheck to disable. Used with Remote Desktop Connection Remote Application information in order to launch the Remote Desktop Connection native remote application and provide connection parameters. Used to store any generic secret that is text based like combinations or credit and account numbers. Secret: [string:secured] A text based secret that will be stored with the record. Used to establish a connection to a host using the Telnet protocol that requires a username and password. Can be used to establish a remote session. Used with Toad Remote Application information in order to launch the Toad for Oracle native remote application and provide connection parameters. Connection String: [string] The connection string needed to connect to the Oracle database. This may require port number, SID and other such values. Used to establish a connection to a Unix host for terminal access that requires a username and password. Used to establish a connection to a Unix host for terminal access that requires a username and key file. For more information, read our blog post and watch our How To Video. Used to establish a connection to a Unix host for terminal access that requires a username, key file and passphrase. Passphrase: [string:secured] The passphrase required to establish the connection. Used to establish a connection to a Unix host for terminal access that would, upon connection, automatically SU (switch user) to a second account. For more information, read our blog post and watch our How To Video. SU User: [string] The switch user to be used with this record. SU Password: [string:secured] The password associated to the switch user in this record. Used to establish a VNC connection to a host computer. Optionally, a password can be added if one is required. Password: [string:secured] Optionally, the configured password required to open this VNC session. Used to store any web portal URL and its accompanying username and password. Useful is sharing remote web login credentials with outside team members. Please note this record type is required if using the Xton Access Manager Browser Extension. Url: [string] The URL to a web page login or signin page. Used to establish a Remote Desktop connection to a Windows computer. For more information, read our blog post and watch our How To Video.